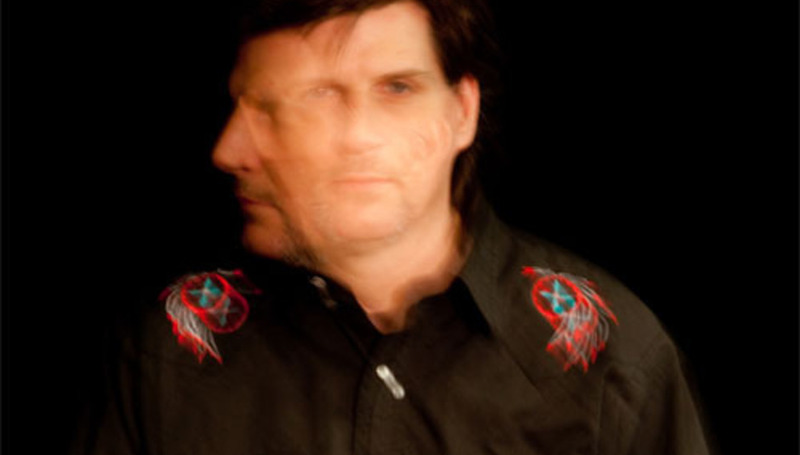 Dylan Carlson, as the lynchpin behind Earth, is without a doubt one of the most important independently minded, experimental musicians of the last two decades. With Earth 2 (1993), he created the template for what would become known as drone, reducing the Sabbath riffs to their very skeletons, slowing them down to a crawl and filling the gaps with humming feedback. The hypnotic effect generated by such a gargantuan, yet simultaneously minimalist sound brought to mind musicians such as Terry Riley, who he has often cited as an influence. Over the next five years, Carlson, working with Kill Rock Stars founder Slim Moon and metal bassist for hire Joe Preston, amongst others, released a succession of albums, which veered between a more hard edged rock sound and what fans had come to regard as the ‘classic’ Earth sound pioneered on Earth 2. Carlson’s friendship with Kurt Cobain ran deeper than the oft-cited fact that it was Carlson who bought the shotgun which Cobain used to end his life, and Cobain’s respect for Carlson went as far as him guesting on an early Earth EP. When Earth emerged after a seven year hiatus, caused by what Carlson has termed ‘legal and drug problems’, their new sound shocked many fans. Hex featured strung out re-recordings of Earth’s prior work, steeped in gospel, blues and American folk overtones. With the release of The Bees Made Honey In The Lion’s Skull, Earth’s new sound was solidified. The album, a slow motion spaghetti western soundtrack, retained that quintessential brooding heaviness and melancholy slowness, yet the range of tones, styles and influences hinted at something far more diverse than Earth had ever previously attempted. Perhaps in light of Carlson’s return from exile, the album has a certain warm, hopeful, even redemptive quality throughout. The Bees… was one of the most lauded albums of 2008, and Earth now return after three years with a new record, Angels of Darkness, Demons of Light 1, which was recorded with the help of bassist Karl Blau (K Records, The Microphones, Mount Eerie) and Lori Goldston (former touring cellist for Nirvana 93-94, Black Cat Orchestra). Since the their reconstitution (parallels to which may be drawn with my last interviewee, Michael Gira of Swans), Earth have toured extensively, showcasing the warmth and rich nature of their new sound which has a surprising resonance in a live atmosphere. Our own baptism of fire took place on a sedated and damaged Sunday morning at Portishead's Nightmare Before Christmas, as Carlson, touring with drummer Adrienne Davies and famed jazz guitarist Bill Frisell cast a hazy beautiful shadow over a truly disastrous festival hangover, as DiS lay on the floor tracing imaginary guitar patterns on a holiday camp ballroom ceiling. What do you think inspired this record?…There’s been a lot of talk about the influences you were attuned to this time round. The way I see it with this record is that it’s a much…liver record, we got the songs recorded and entirely worked up on a two week tour ahead of going into the studio. It was was a very live setting: we all set up and played together. We didn’t worry about the kind of things you normally worry about, like isolation and amp leads. I think that’s the big difference between working with someone like Randall Dunn (The Bees Made Honey In The Lion’s Skull) and someone like Stuart Hallerman (Angels of Darkness, Demons of Light, Earth 2). Randall is much more of a Phil Spector type. He’s that controlled type of producer who wants the perfect sound, the perfect tape, the perfect song. Whereas here it was much quicker. We got the whole band together, Stuart owned the studio we did Bees… at, but he decided to engineer this time, I’ve know him for a long time, I knew him before I worked with him on Earth 2. He had a more laidback approach to sound and our intention was to get stuff to tape as simply and as quickly as possible, which meant the sessions this time round were very productive. To my ears there’s a tangible darkness and melancholy - maybe even morosness about Angels of Darkness – whereas the previous record felt a lot lighter. Is there any reason you can pinpoint for that? Right before I went in to do this record, I had a major health problem and was hospitalized. It was actually a case of me realising my own mortality at the time, and there was very much this feeling that it might be the last record….We’ll get to make some more records in the future hopefully (laughs). But yeah, I was trying to get as much done as possible, which lent it that edge, I guess. My doctor said I should have been in hospital at the time. The cello, like so many of these things are, was a happy accident. Steve Moore (previously of Earth, Stebmo) introduced us to Lori (Goldston, formerly of and she filled in for him during the studio sessions. I’ve always loved cello and bowed strings and I like the way she plays, you can tell she does a lot of other kinds of music: jazz, middle eastern., rock stuff… And yeah, this time it was a very rock cello, putting Lori through an amp and her playing with us in the studio. I think what I liked most about the cello was the opportunity it gave me to reduce the music down to two intertwining melodies – it just seemed to work very well. When we found out Steve (Moore) and Don weren’t going to be able to do the record, then it just made sense to ask her to join us on tour. So what is the biggest change from The Bees Made Honey, for you? To me it’s different in that it’s not as heavy, but more notably not as dense sounding, I think we used reduced instrumentation which made me focus on a more melodic approach. The funny thing is that maybe that wasn’t the intention to begin with: when we intend to do things one way it always seems to turn out differently. I mean, working with Stuart again, made me think about the stuff we did with Earth 2 which we would have done differently now… To me, now, Earth 2 has the very claustrophobic sound and feeling to me, rather than the vast one we were aiming for. I would have done it differently if I was recording it now. How did you feel about the most recent re-issue, in light of that? How did it come about? Well, the last tour we did back in 2009. And in addition to the original fans, there were new people who were there, who maybe hadn’t heard Earth the first time round and were only just catching on. So we re-issued it for them. And I think it was nice to hear it as a whole record and have it re-mastered for vinyl. We just felt like it was a nice thing for people to be able to have since we’ve had three years without an album. Hopefully the older fans will get to hear it as a whole record, which is actually how it was intended. The first song was actually going to be a seven inch single ahead of the main release, and then Sub Pop came back to us and said “Hey, why don’t you release two 7 inches…”. It’s interesting that the live arena seems to be what brought that to mind. In light of that, would you say that Earth is a studio band or a live band? Which is it that you prefer doing? I like the live thing the best…I really like live music…I like playing with other people. I think that as Earth as a band becomes more collective, so will the shows. I’ve always considered the audience as a major part of the whole experience. Music was always a live thing to me and this recent trend of separation between musicians and recording artists…that whole structure is starting to fall apart, I think. So I think that the live thing will start to be more important again. Taking it the public will be more important again. I definitely hope so. You’ve toured pretty widely since 2008 – can you remember any highlights from that? I really like Bristol. I like Leeds and Dublin…Gotheburg in Sweden. Spain, I mean Barcelona, Bilbao. Vienna was really cool too. But man, Innsbruck was the craziest, it was totally off the hook. It was a really small club, and it was crazy. It felt like the whole club was totally headbanging the entire way through - it was kinda weird. They were singing along to the guitar lines! All the guys in the front row seemed to have really long dreadlocks that kept getting stuck in the guitar…. Which actually got kinda annoying. I really can’t picture that. Can you imagine writing a record to headbang to ever? What do you think the future holds for you, and for Earth, musically? There’s certain things I always seem drawn to like tempo wise and song length wise and I’m always trying to integrate into what I’ve done while also trying something a bit new. But I never want to do ‘genre‘ type records – a rock record, a drone record, et cetera. I’ve always been fascinated by how we experience sound, actually… There’s this thing called the false harmonic, about how the overtone series affects how we hear sounds. La Monte Young talks about it a lot in his writing. The ear starts to hear notes that aren’t really there because of the vibrations at certain frequencies. I guess that’s something I’m constantly interested in creating with my music. As for the future, I get enough satisfaction from Earth right now, but I have an idea for doing a solo record at some point, I’m trying to talk Greg (Anderson – Southern Lord Records) into it, and maybe it’ll happen next year and maybe it won’t. It’s something that’s generating. I’m not against vocals or something like that, so maybe there’ll be some on it. That would be interesting, hearing Earth reduced to one person. What you were saying about La Monte Young makes me think about the hidden complexity in Earth, a lot of classical touches, maybe. Where does that come from? I don’t know! I guess there’s this one piece by Richard Strauss – called 'The Metamorphosis', I love the opening chords, and I think I sometimes try and channel that with Earth. I would really love to write a concept opera actually, but I don’t write music or read it, so that might be difficult. I’m an idiot savant in that sense, or at least that’s what my girlfriend tells me (laughs). It’s funny ‘cause a lot of times when we’re practicing I’ll forget a part of one of our songs because it’s never been written down for me. I guess that means to me the song structures seem normal, but musicians who can read music tend to find it complicated. I like the idea of an Earth concept opera… I think that your sound is above all else, extremely cinematic. Are soundtracks something that has ever interested you, or something you’d like to pursue? I would love to do more soundtrack work, actually. We just did a track for The Limits of Control by Jim Jarmusch, We also did some tracks for the Art of the Steel, produced by Hank Williams the IIIrd and Jonny Knoxville, but I don’t know whether that’ll ever see the light of day. It’s starting to open up for us but I don’t know whether it’s something we’ll do a lot more of in the future…who knows. It would actually be kinda cool to do a movie that wasn’t that style, just to be contrary. It would have to be something slow, though, I think. Actually, just the other month I found out that there’s this Norwegian or Swedish director who was influenced by Earth, and he’s made a film inspired by our music. His name eludes me at the moment…But it’s nice to find that you’ve done something people really like and are influenced by. I mean, I have my influences that drove me to do something, it’s gratifying. Yeah, it must feel really exciting to see people picking up instruments, or creating, because of you. When you get the chance, what do you tend to listen to these days? I mostly listen to older stuff, I guess ‘cause I’m an old fart now. Fairport, Pentangle, y’know that kind of stuff. At heart I think I’m a classic rock guy. I grew up on Deep Purple, Zeppelin, Sabbath, Grateful Dead and I kinda always return to that, when it comes down to it. In terms of new bands… I love Wolves in the Throne Room – they’re very different kind of people I think – they’re kinda hippie folk stuck in a metal world. Great records. I thought it was cool – everyone did an interesting job of it – back then I was more intrigued by remixing and that kind of stuff. At the time that was. These days I think I’m less interested. I don’t know what changed, but maybe some people will want to remix stuff later and I’ll enjoy that too. Talking about change, obviously the last few years prior to Bees…have seen a bit of a life change for you. What triggered that? To be honest it was as simple as realising that I didn’t want to end up in prison wasting away. That was a big change, now that I’m older and hopefully wiser, y’know, I wanna spend my time doing music, and touring and playing live rather than wasting way. And I hope that continues. With thanks to Dylan Carlson and Lauren Barley at Rarely Unable.